Wedding Cake by Tuscany Cake designer Melanie Secciani. Some cakes just come to life in your mind. This was one of those cakes. I was asked to create a cake for a Marie Antoinette inspired shoot in Florence, Italy. At the shoot I had a large cake (you can see that one here) that I created, but I always like to create something that the crew can eat after the shoot. And also that is smaller, since a lot of the weddings I design for are destination weddings so might not have 300 guests. But the couples still want a cake to have huge impact. The night before the shoot, I still hadn't come up with a clear inspiration and was really starting to worry about it. I woke up at about 4 in the morning with this design in my head. I literally jumped in the car and drove to the studio where I raced to get this cake done in time for the shoot. There are a lot of magical details that I really love. It's a smaller cake with just 2 tiers and then cupcakes, mini cakes and teacup cakes that go with it to create a much bigger effect. My favorite detail was the flowers. First I painted them onto the cake, and then I created individual sugar petals so that it would appear that the flowers were emerging from the tiers. The pale green background with the bright yellow and pink flowers really gave it a vivid appeal. One of the things I hear from brides a lot is that they want a kind of cupcake display, in terms of size and spacing, but want something a little more special than just cupcakes (no offense to cupcakes - I love them). For this display created individual mini cakes with the same flower technique as the top cakes - my goodness they had drama! Then I put some of the cakes into little teacups. That was one of the best features of the cake. I noticed after the shoot, those were the first to go, because the crew could really easily pick them up and walk around with them. And they loved the edible sugar butterflies that decorated the teacup cakes. And then of course a few little cupcakes with the drama of yellow sugar roses on them. Inside the cakes were our signature Chocolate Cherry Truffle Cake and Moist Vanilla Cake with Vanilla Mousse. For information on Cake Flavors , how to determine the Size of your cake, or on cake prices we are happy to answer any questions you may have. Contact Us to reserve your cake. 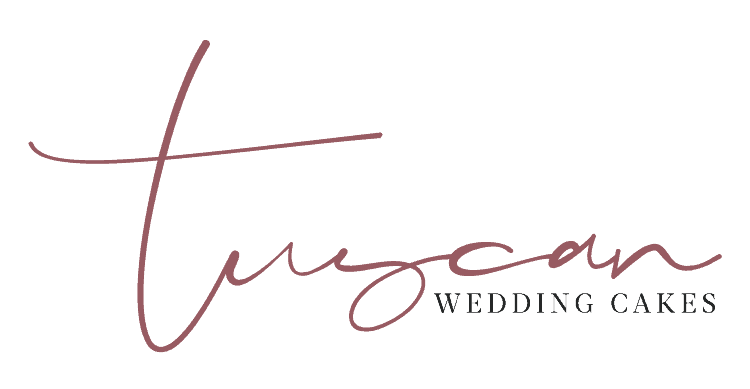 Tuscan Wedding Cakes, Italy's premiere wedding cake designer, creates spectacular designs for destination weddings and events in Florence, Tuscany, Siena, and throughout Italy.